A wide range of Purus Floor Gullies for vinyl, tiled and resin floors are available in plastic and stainless steel. Our BBA-Certified Minimax 50 is our most popular floor gully with a height of just 76mm including falls, and incorporates the NOOD no-odour water trap. The NOOD will not allow any foul air to leave the drain even when it dries out, making it ideal for use in health facilities, disabled access wetrooms and care homes. The NOOD is also included in our full Mini Series floor gullies range which includes the Minimax Two Part, designed for simple installation into our Self-Supporting Wetroom Former Trays, and the Mini Brage 50/110, which have vertical outlets. Stainless steel grates for vinyl, tiled and resin/micro-cement floors are available for a premium finish. We have also more recently launched our brand new 59mm S-Series floor gully for concrete floors with a vinyl or tiled finish, which incorporates the same NOOD trap technology as the Mini Series range. With a total height of just 59mm, the S-Series gully can fit into shallow screed, preventing the need for the contractor to install a vertical outlet floor gully through the slab. The Purusline Living is our linear wetroom solution which allows you to create a beautiful, functional and stylish space in your tiled bathroom. We offer the Purusline Living channel in lengths of 600mm and 800mm, with three options of gully to suit your installation; and three fully stainless steel grates to create your perfect finish. These include the Tile Insert grate, which allows for a minimalistic look where the tiles sit into the grate to match the wetroom floor; and the Drop and Twist patterned grates. Purus also offer the Purusline Living Centre Linear Board (for joist installations) in two different sizes to suit the channels; and a Puragum Tanking Kit, for tanking your wetroom. Purusline Living channels all have BBA Certification and are featured on BIM. For vinyl flooring, the Purusline Living Plus is the ideal solution. The linear wetroom solution for domestic and commercial projects has many of the same features as the Purusline Living for tiled floors, but has now been optimised for installation into vinyl floor finishes. It is available in five different lengths from 600mm to 1000mm and comes with our stainless steel ’Chess’ designed grate which is installed flush with the vinyl flooring thanks to our new clamping ring technology. The Purus Channel 100 is Purus’ stainless steel channel solution for industrial and commercial projects. 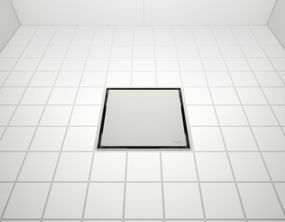 With a width of just 100mm but a high flow capacity, the Channel 100 with a load-bearing mesh grate is suitable for use in industrial areas such as kitchens, healthcare facilities and laboratories; whilst when installed with a choice of designed patterned gratings, it is ideal for bare-foot areas such as spas and hotels. A bespoke service is available with lengths up to 6m. A wider selection of stainless steel channels is available including the Channel 200, Channel 300, Industrial & Laundry Gullies and Kitchen Channels. Purus’ Stainless Steel Interiors range includes kitchen worktops, cabinets, shelves and more. The products are available in both standard and bespoke sizes and are used mainly in private kitchens, catering facilities, hospitals and laboratories. Purus offers a wide range of plumbing products, with the PUM (Purus Universal Membrane) at the forefront. 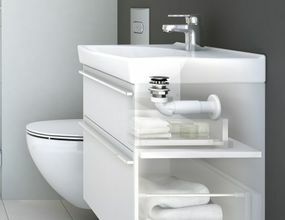 The Basin/Bidet Waterless Waste with revolutionary PUM technology is a new low-level membrane which saves space without reducing the flow capacity. A range of 7 Pipe Connectors with 60 connecting options for a range of pipe materials and sizes is also available. Purus’ Stainless Steel Sanitaryware range includes WCs, sinks, urinals, plaster separators and more. They are made of robust, durable and high quality stainless steel; and are often used in areas where there are high requirements for durability and hygiene such as in prisons and high-security establishments; public toilets, leisure centres and restaurants.